The first Samsung Galaxy Note was launched in 2011, a bold vision by Samsung to create a large-screen smart device with a built-in stylus pen. Sales was cautious in Singapore because it was just too big to swallow by the general consumer whose benchmark for phone size included the wildly popular 4-inch iPhone. One year later, Samsung’s Galaxy series achieved phenomenal market growth thanks to their excellent product feature set. Months after the Galaxy S3 was announced, Samsung launched the Galaxy Note 2, with thorough rework to make full use of the stylus pen that differentiates with the S3. There were so much smart features that I gave it a thumbs up in my review. The Galaxy Note 2’s success opened the floodgate for large-screen smartphones, but competitors were cautious about making the smartphones too big. Still, the average screen size grew from 4-inch to 5-inch, comparatively making the Note 2 a little easier to swallow. On my hand for review is the Note 3, where Samsung further improved the feature list and attempted to further differentiate it from the Galaxy S4 to make it a compelling smart device. What has Samsung done on the Note 3 to achieve that? Designed to feel like a physical notebook, the Note 3 rear has a leather feel (for black model). The sides have lines to make it look like book pages. The Note 3 uses USB 3.0 connector, so data transfer is very fast. You can still use the normal USB 2.0 cables for charging and data transfer. The white model’s rear cover feels plastic without the leather feel. The front plate design is criss-cross while the black model is brushed aluminium pattern. The black model is definitely classier-looking, but the white would be more popular with ladies. It is ironic that while the Note 3 has a larger screen than the previous Note, the overall size turns out smaller, because the Note 3 screen stretches to the edges more. Samsung also made a point to make it yet lighter. I also like that the build feels a lot better than the Note 2, and I feel more confident manhandling the device without fear of dings or cracks. It’s quite fascinating to see how a change in design and materials make a product feel better. I’m not going to talk about the long list of existing features in the Note 3 that are carried over from the S4 and Note 2. Some are game-changing and copied by other brands (like Air View, Quick Glance, Smart Alert, Cover to mute/pause), while others are gimmicks (Smart Scroll, Smart Pause). Not to mention the excellent 13-megapixel camera and the default 32GB storage, it’s a smartphone that has it all. When you remove the S Pen or press the pen button while hovering your pen over the screen, the Air Command menu will appear on-screen. – Action Memo: the star of the feature, allows you to scribble on-demand, say during a call. The magic is that the Note 3 recognises your handwriting and lets you use the content. If you have written a phone number, you can make a call or text to it. If it’s an email address, you can compose an email. If it’s an address, you can search on Google Map. If it’s a URL, you can go to browser. – Pen Window: draw an area on the screen, choose an app to run, and voila, you have a hovering window to let you run another app. 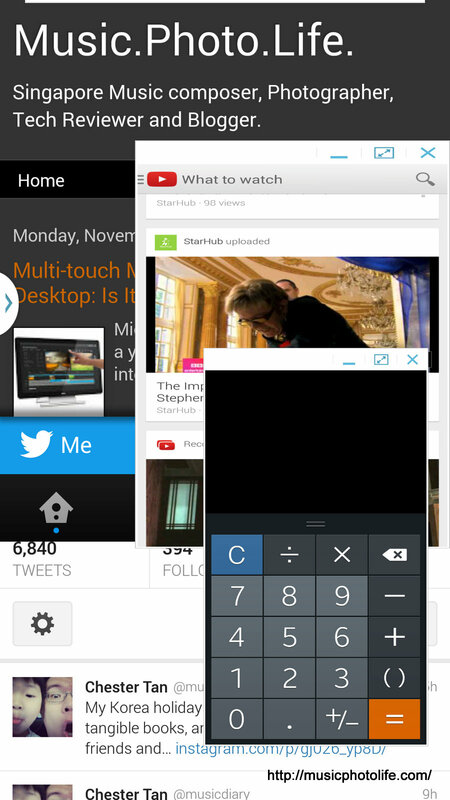 It’s amazing that on top of the Multi Window, you can run multiple floating app. Seriously, 5.7-inch is not big enough. – Scrapbooker: use your pen to select an item on-screen, and the phone recognises the area that you want to cut. The area will then be cut and stored in the Scrapbook app as an image for future use. It even stores the words within the image area in text form. In other scenarios, hovering your pen over some buttons will bring up contextual items for you to choose instantly. For instance, when hovering over the “Insert” button, a list of recent content appears. When hovering over the Messaging “Add Recipients” button, a list of your recent contacts appear. The Note 3 now lets you adjust the scale of the entire phone screen like an on-screen emulator, not just the keypad or the keyboard. This means you could use the phone like a 4-inch device. How cool is that? 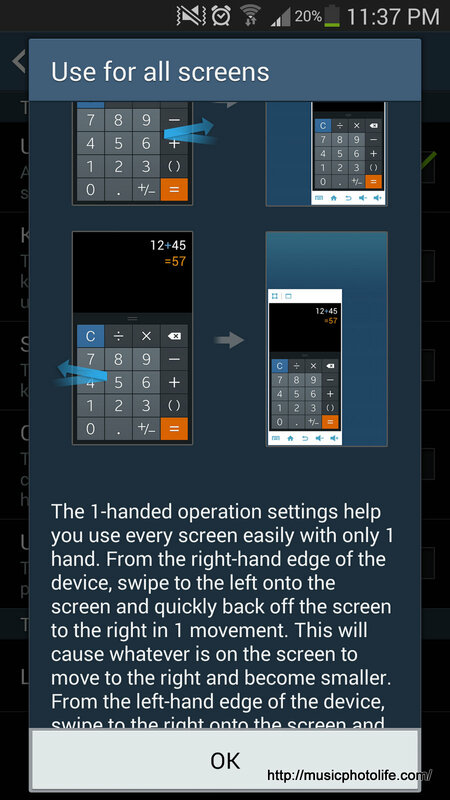 This feature can be enabled from the “Controls” tab under Settings. Found under the “S Pen” menu, enabling this feature allows you to switch between keyboard and pen inputs instantaneously. You can even write in several languages at the same time without switching. Previous Galaxy phones doesn’t allow you to open same apps in 2 windows. Note 3 now allows. In addition, you can easily drag and drop content from one window to another. Swipe up on your homescreen will show the news feeds that you picked. For user who has no interest in this feature, it would be good if Samsung allows the gesture to be customised to open other apps. The Galaxy Gear can only work with Note 3 or S4 (the list will be growing). So if you want to enjoy the fun of an intelligent and intuitive watch, you would have to get the Note 3 for full feature compatibility. That alone is a good enough reason to get yourself the Note 3. A useful feature introduced in the S4, the Note 3’s S View window is bigger and more customisable. I would certainly pay to get one of these covers that protects the Note 3 yet allows me to use the phone effectively. It’s mind-blowing to own a piece of future-tech. You can actually record 4K video on a consumer device. Even though you don’t have a UHDTV yet, you can still play on your existing computer or devices with magnified detail. However, the quality is not pro-grade. Under indoor lighting, the video looks grainy and lacks detail. Recording in 4K also loses some live recording features. The battery now lasts longer than the predecessors, thanks to 3200mAh battery. But based on my usage battery, it still lasts me a working day, no different from most other phones I have tested, with the exception of the HTC Butterfly S.
So, what are the compelling things that make Note 3 a worthy buy? To me, it’s EVERYTHING. While I would love to recommend other brands, I have to say that the Samsung Galaxy Note 3 has it all. The hardware is excellent, from the 2.3GHz quad-core processor to the 13 megapixel camera, UHD video recording, Full HD Super AMOLED display, large battery capacity. I love the multi-window, the lightweight, the solid build. And the best part? Samsung Note 3 does not feel big at all. While other phones like Sony Xperia Z Ultra or HTC One max is pushing the limit, the Note 3 handles well on my hand. I do need to stretch the fingers to touch the keys when using one-hand, but the textured rear casing gives me a good grip to avoid any slip-ups. Yet, the one big thing that puts the brake to owning one, albeit trivial, is the extremely dated TouchWiz interface theme. Its wallpaper too loud, its icons too big, I feel like I am still using an old phone. The issue cannot be resolved by using another launcher, because the core theme still appears on the dropdown screen, the Settings screen and even the pop-ups. 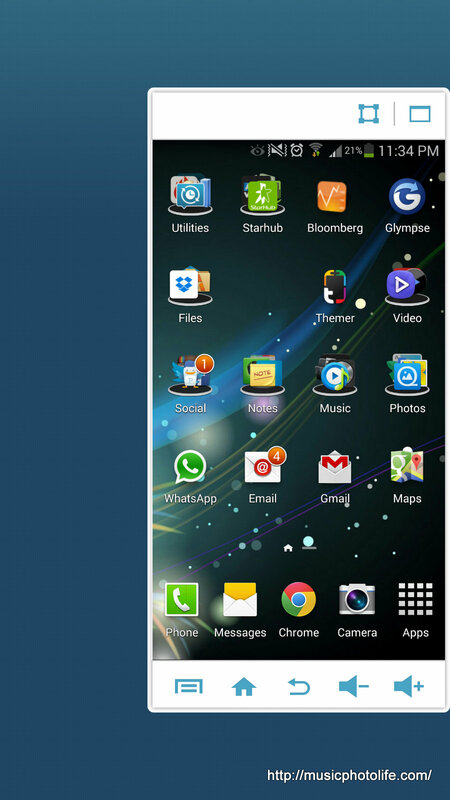 If you still love the TouchWiz, then there is no reason not to love the Note 3.